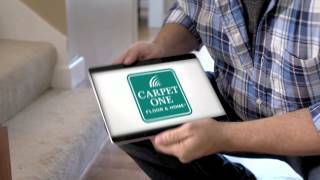 "Trust the experts at Carpet One to get it right the first time with a FREE in-home measure." Thank you for visiting Carpet One's Shop at Home page. We appreciate you considering us for flooring and believe the experience you'll receive in home will be comparable to how we treat you in the store. When filling out the information make sure the types of flooring is noted along with any other description or ideas you might have interest in i.e. frieze or hand-scraped hardwood flooring. This will help us better prepare for our visit. In addition, please provide us with some flexibility on date and time. Our goal is to get to you as quickly as possible, but in some cases due to our traffic load this might not be feasible. Please help us in making this experience a positive one. We look forward to working with you on your next flooring project! Shopping at home is as easy as shopping in our showroom. Simply narrow down your ideal flooring choice, choose color options that match the color scheme of your home, and let us do the rest for you!